And the other half are swimming in the wrong direction. Remember way, way back, you know, like a month ago, when folks used to think Prime Minister Abe Shinzo should wait until the December revision of the third quarter GDP figures came out before he made a final decision on whether or not to approve the second rise in the consumption tax? If you cannot remember, this was back before the November 3 Shukan Bunshun article revealed Abe's and Chief Cabinet Secretary Suga Yoshihide's tumescent desires for an election (that's with an "l") and the whole world's going nuts over the November 17 preliminary release showing a 1.3% decline over the previous quarter, making Prime Minister Abe's announcement of a Diet dissolution in the evening on November 18 almost an afterthought. TOKYO - Japan's fall into recession between July-September could turn out to be less severe than feared, with new capital expenditure figures out on Monday suggesting revisions will put the third quarter in a slightly more positive light. The 5.5 percent year-on-year rise in capital expenditure over the third quarter reported on Monday followed a 3.0 percent annual increase in April-June, which could ease concerns about recovery from a sales tax increase earlier this year. If the revised GDP figure for the third quarter turns out to be close to zero, meaning that all this panicked action was for nothing, then there will be hell to pay. If anything is going to tick off Japanese voters it is a Diet dissolution and an election for absolutely no reason. 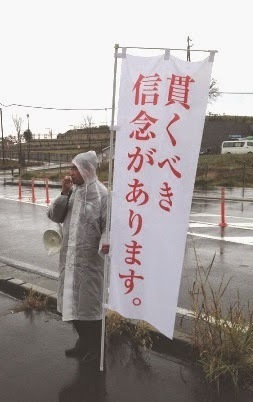 And for folks like the urbane, serious and admirable House of Representatives member Kono Taro (LDP, 6 elections to the Diet) who has been posting hilarious and sad photos of his bedraggled, lonely self campaigning in the cold late autumn rains (the above photo is from yesterday) learning that this was all for nothing will make future relations with Abe and his confidants a bit...testy, shall we say? "If anything is going to tick off Japanese voters it is a Diet dissolution and an election for absolutely no reason." Is going to vote seen as that much of a bother? Or am I missing something? Even if it was unnecessary, this looks rather benign as far as annoyances go, especially since the LDP is expected to remain in power (I could understand some people getting annoyed by a change in majority, but it looks unlikely). Kono Taro is actually one of my favorite politicians in Japan. My ideal scenario would be LDP gets hammered in this election leading to a slim majority and Abe has to step down. Then Kono Taro is elected as leader of LDP as he should have back in 2009. Unlikely to take place though.